Adventure Fantasy Game is out now. Click here to buy it. All started fourteen months ago when Sham posted three preview posts of the Bleak Beyond. After getting his permission I started to design, develop and test an SRD-based game based on his rules. Earlier on I decided that the game was not going to be a retroclone, and to drop the SRD. The entire system is based on 5MORE, the concept that most times to succeed you need to roll a d6 and do 5 or more, applying very few modifiers, if any. The only dice used are six-siders, but tt’s still statistic compatible with most old school fantasy adventure games and retroclones, meaning you can yank gaming material from the past 38 years of our hobby and run them with no need to change anything. The class system is very flexible, based on a MUD developed in the nineties; it’s similar to both multiclassing for d20 (without some of its fastidious problems) and disciplines from World of Darkness. The Vancian system has been ditched, replaced with a mana-based system after a bibliographic survey, long pondering and a talk with Roger. About 100 new original spells have been written. Clerics are gone, replaced by a more meaningful approach to worship. 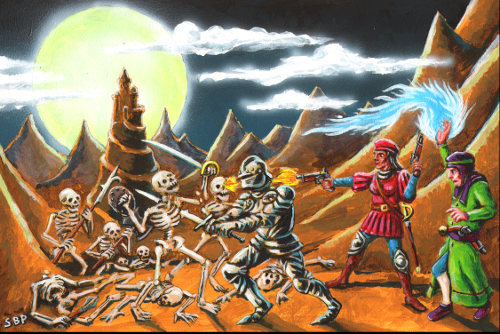 Two combat systems are included: the introductory one is a traditional “roll against armour”, while the advanced system features melee contests and armour reducing damage. Then, as I ran more and more playtest sessions, the game incorporated elements inspired from very bright designs such as ZZarchov’s Neoclassic Geek Revival and Delta’s Book of War. Included in the manual there is also an 8-page hexcrawl adventure with a colour map: “The Temple Beneath the Harga Volcano”. It features mountains, glaciers, lakes, giants, cannibals, giant argonauts, squid templars and a Golden Idol of Cthulhu. During testing no experience points were ever tracked. Players came up with really inspiring and story-driving accomplishments to complete to level up. We got rid of grind, beancounting, killing the last kobold to pass a level. Characters plotted to murder nobles, chased murderers and bandits, gathered bands of soldiers, accumulated a fortune and chased fabled tomes and golden idols of Cthulhu. The change in attitude, from chasing experience points to chasing meaningful action, surprised and pleased us all. And I hope it will please you too. 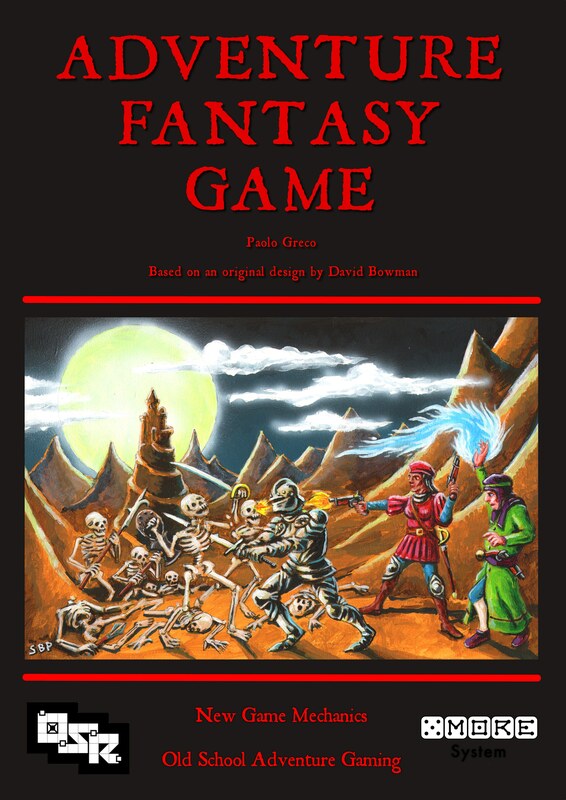 Adventure Fantasy Game is available as PDF and Softcover+PDF. Both versions will give you free updates and the LaTeX source code to rebuild the PDF in case you want to kitbash it or change the layout. Click here to buy Adventure Fantasy Game. I went through all the titular experiences in the past 10 days or so. On top the new flat doesn’t have an internet connection, so my Internet presence is minimal. The AFG proof is being printed right now. The softcover will be printed on A4, 100gsm paper and perfect-bound. I expected to have it staple bound but the new printer prefers perfect binding for 60 pages and up. Another very welcome bit of news is that “The Temple Beneath the Harga Volcano”, the sandbox-adventure at the back of the manual, will sport a colour map in an otherwise black and white book. The local printer shop is awesome. In the meantime my local AFG group swelled up to 8 people. While I think big groups are awesome, some of my players want more of my attention, so from this week I’ll start running two weekly games. One in my flat and the other, every Saturday night, at Spellbound Games, just off Victoria road, Glasgow. The latter is a drop-in, everybody-is-welcome game, and is great fun. UPDATE: the link below is to the unedited first chapter in its final version. The new version will be uploaded soon is finally here. AFG character creation is built to make players hit the road in minutes. Have you rolled 3d6 for each stat? Have you picked a Way: Caster or Fighter? Have you rolled your hits according to the character’s Way? What about Mana? Have your rolled your random equipment? For Fighters: have you picked your weapon of choice? For Casters: have you discussed your starting spells with the Referee? Are all the above written on your character sheet? And that’s pretty much it. And people asked me if they can make handouts and the like and, well, yes, of course you can, third-party support material is 100% awesome. And if you want to send them here I’ll put them in the AFG site (which will go live soon). Download the first chapter of AFG in a PDF file (not the latest revision, download to be updated soon), covering character creation and Ways rules (Creative Commons BY-NC-SA). Summer is great. Not for the reasons you might expect though. I got up at 5 this morning, because the evil daystar decided that it would be totally rad to shine through my north-facing bedroom window straight on my sleeping face. Anyway, work on AFG continues, despite the improbably bright evenings and morning. As the title says I’m done with the “writing” stage: the text is complete. Mind you that the rest of the book went already through proofreading and revision twice (by native English speakers with better spelling and grammar than mine); the adventure in the back of the handbook is a late addition and needs polishing; two more rounds of proofreading, revision and then off to the printer the 13th of June, then ship the hardcopies the 16th; this gives us enough slack to actually still have plenty of things going wrong and still ship the copies in spring. It features cannibals, terrorscarabs, a marginally active volcano, glaciers, a giant or two, hexcrawling and many corpses. And what Gary should have put in the Underdark had he been not obsessed with black elven chicks in chainmail bikini. I’m not sure how, starting from a simple custom area generator I ended up with Blobblibl, Fallen Squid Templar of Cthulhu. But he’s awesome. He also wears an ecclesiastical tiara. Those that bought AFG will receive an email shortly. Tomorrow I’ll go and have a chat with my local printer and the third FLGS of the area to finalize the last money- and time-details (yes, three stores will carry it, I cant believe it either). The final price for the Print+Digital+Source Bundle is going to be 12£ plus 3£ for shipping, while the Digital+Source Bundle is 4.50£ and gives you a 4.50£ discount for the Print version. If you want to order a copy either send an email at tsojcanth+AFG at gmail dot whatever stating your Paypal account, version wanted and, if needed, delivery address, or just send me the correct amount of money together with the details. Both version gets you unlimited PDF and Source updates forever, because bugs need to be fixed.